This simple but yummy summer pasta salad was inspired by a Food52 post I saw last week. 'Tis the season for this type of fresh, light, easy meal. At this time of year, delicious meals practically cooks themselves - it's often a matter of just combining a few fresh, flavorful ingredients. I used cavatappi (which translates to "corkscrew" - makes sense, right?) but anything will do, penne, orechiette, elbows, etc. I made use of the first ripe cherry tomatoes from our little container garden and a generous handful of fresh basil from our potted plants. Seeing those first 'maters turn red never fails to thrill me. I added some onions cooked with chunks of thick slab bacon I bought from Northwinds Farm at our little Woodstock Farm Festival. Then tossed in some surprisingly sweet local corn we had left over from a meal earlier in the week. 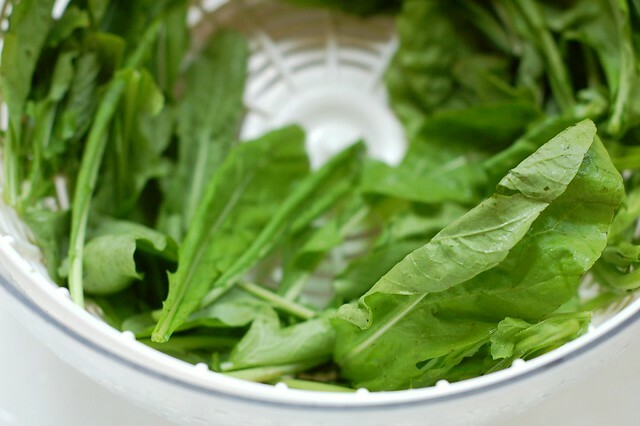 Fresh arugula (I used a mix of our own tender greens and a bunch from our CSA) added a nice peppery green counterpoint to the sweetness of the onions, corn and tomatoes. 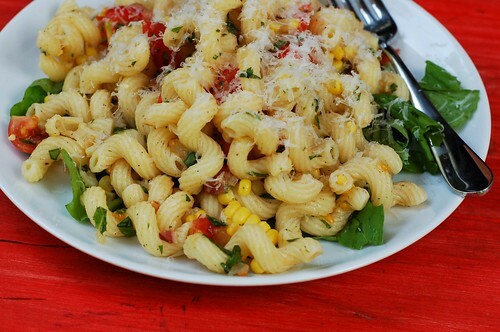 You can either mix the greens in with the pasta or serve the pasta on a bed of them. Then cover the whole thing with a blizzard of grated Parmesan. I made enough for us to have for dinner and for lunch the next day and we were delighted anew both times. 1. Boil a large pot of salted water for the pasta and get it started cooking. 2. 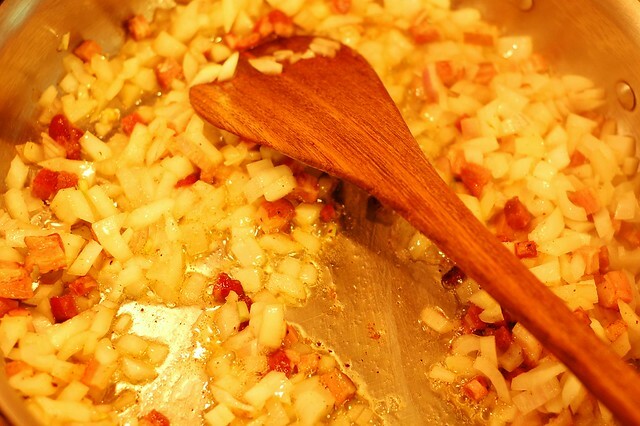 Saute the bacon pieces and the onion in a frying pan until the onion is translucent and the bacon is crisp. You may need to add more fat (but probably not) in which case you can either use some olive oil or some bacon fat if you've headed my recent tip about saving your bacon drippings. 3. 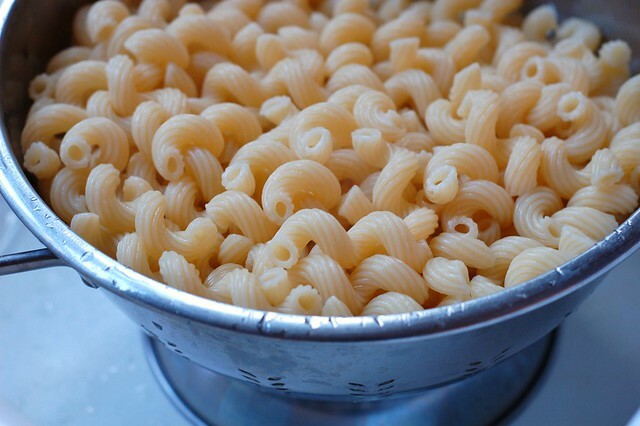 Once the pasta is al dente, drain it and toss it with some olive oil in a large serving bowl. 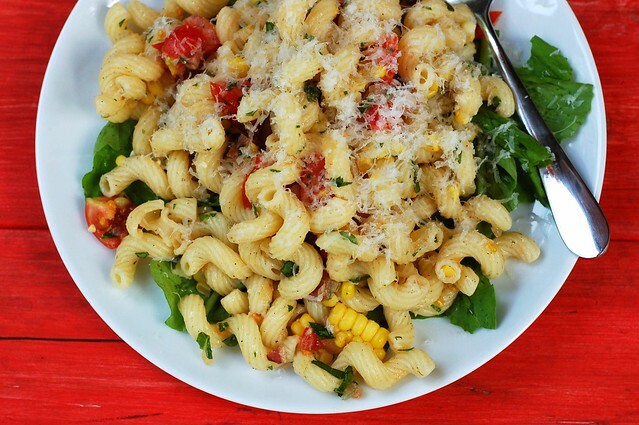 Add the tomatoes, onions and bacon, herbs, corn kernels, and arugula and toss to combine. Season with salt and pepper to taste and top with grated Parmesan cheese. Want even more recipes, photos, giveaways, and food-related inspiration? 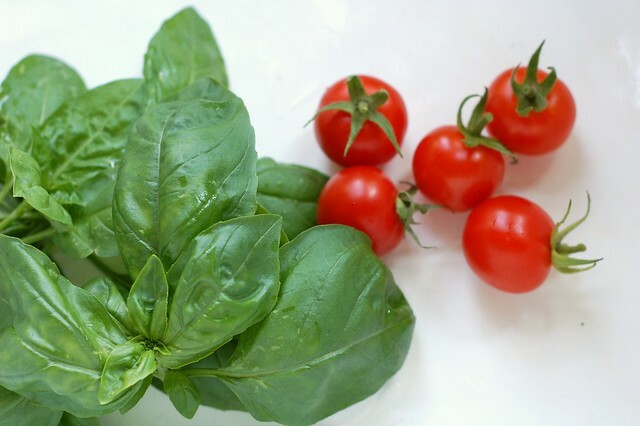 "Like" the Garden of Eating on Facebook, or follow me on Twitter or Pinterest. This sounds wonderful and I love that you made extra for the next day...something I would do for sure.